Our paper plate is a kind of plate made by paper card. We have advanced equipment, high technology, improved process and professional staff, experienced guidance to ensure high quality and good service. All of our products are made from eco-friendly, food grade materials. Also, this item's appearence is elegant & beautiful. 濾 114 PICS BEAUTIFUL CUTE UNICORN PARTY DECORATION. Our cute pink pack provides all party supplies you need in one quality collection. Don't waste your gold coins buying more. Serve at least 16 guests. You do not need to think of what might be missing for your party. 濾 IT CONTAINS NOT ONLY THAT BUT ALSO OUR SPECIALS. We will set up lucky suits which not everyone can get, there will be 1 people can get "SPECIAL GIFT" for every 100 people. Hope you will catch it! 濾 EVERY GIRL & BOY DREAM THEME. Make your child wish come true! 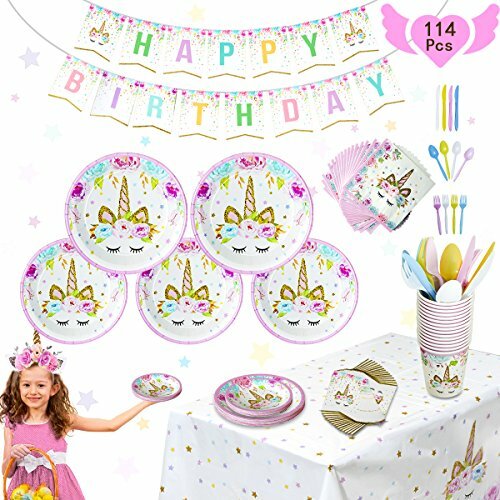 One of a kind Unicorn Party Decorations ( They really do exist ) Throw your child the Best Birthday in the world with this Magical Unicorn Themed Party kit. 濾 HIGH QUALITY & RELIABLE MATERIAL. The products are safe and non-toxic. Plates, Cups and Napkins are made of environmentally friendly biodegradable paper. Just take it home with confidence and enjoy the cute and special unicorn themed party. Your kids will be super excited and enjoy the decoration. If you have any questions about this product by ONE PHOENIX, contact us by completing and submitting the form below. If you are looking for a specif part number, please include it with your message.